My Nicholsons Guide says the L&L Rufford Branch locks are 62ft long. My boat is registered as being 62ft but when I bought it my surveyor said it was actually 62ft 6 inches. A boater mate who has a 60ft said it the locks were extremely tight when he went through them in his boat and doubts I would be able to do it with my length, so what do those of you who have done it think? Have you been through them in a 62ft or over and if so how did you find it? I suppose if it proves to be too tight I could go diagonally but would I be allowed to do this because I've read on here that on occasions CRT have banned boaters doing diagonals on the 60ft long Wigan to Leeds locks? I've already booked my passage on the Ribble Link so I'll be gutted if I have to cancel. The new Ribble link locks were built full length because HNBC (historic boat club) reckoned that with a bit of work on the cills and gates a full length boat might get down there one day. 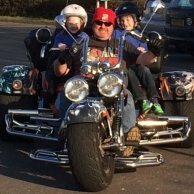 Going diagonal is no problem, the Rufford arm is a lonely place, you are unlikely to meet any CRT people to tell you that you can't do it. I suspect you will be fine as long as you are happy with tight locks, but hopefully somebody who really knows more will give an answer. I have asked about the maximum length in the past so a forum search might turn up something. Rubbish! A local boater used to have a 64ft boat and regularly did Wigan on it. They have been known to ask you to skip a position in the queue if they can share two 57ft boats on the flight, but you will get the next slot or you will share with a (much) shorter boat. To be honest on Wigan Flight there is rarely a boat to share with unless you wait a day or two, so you would be fine. On the Rufford Branch, I have only shared once in all the times I have done it. It is not a busy waterway! At 62ft6in you will need to go in through one open gate and tuck behind the other closed gate, but that is not a complicated thing to do. The published limits are generous for those that don't know the more advanced techniques, so they can just come and go without thinking it through. We have shared a 60ft boat and a 45ft boat up the Calder & Hebble where everyone says you can't get more than 57ft through the locks. I think there were 2 locks we couldn't quite share. Crossed posts with @dmr. I think we are both saying the same thing - you will fit if you are both clever and patient! The critical technique is being able to tuck behind a closed gate going up, as that gives you an extra 2 feet or so, but all the Rufford locks are wide so it's fine. You will get wet going down though - make sure you don't let too much water in the back of your boat! Going down, just take your time. The cills are rounded not straight, so you need to to have the bow in a corner and the stern in the middle, but without snagging on anything. If in doubt, close the paddles! For what it's worth, I would do it in a 63ft boat, and if you are doing it before the middle of May drop me a PM and I will come and help if needed. My boat is 63ft 8in without fenders to tip of the rudder. I went across from Leeds to Wigan last year at an angle through locks. Couple of them were fairly tight such as ones on the Bingley flight and the shortest one on the canal who's name escapes me right now. If those really are the shortest locks on the whole canal, The Rufford branch shouldn't be a problem in yours as long as you take your time and remain fully aware of the boat at all times in the locks. One of the risks of the diagonal technique is swamping the back deck when descending. We are 57ft, and descending the Calder and Hebble was touch and go at the top end with heavily leaking top gates, and you have no choice but to go near the flow in order to exit the lock. Some of the locks on the Rufford branch are a bit more benign but, if you do decide to do it, take great care. 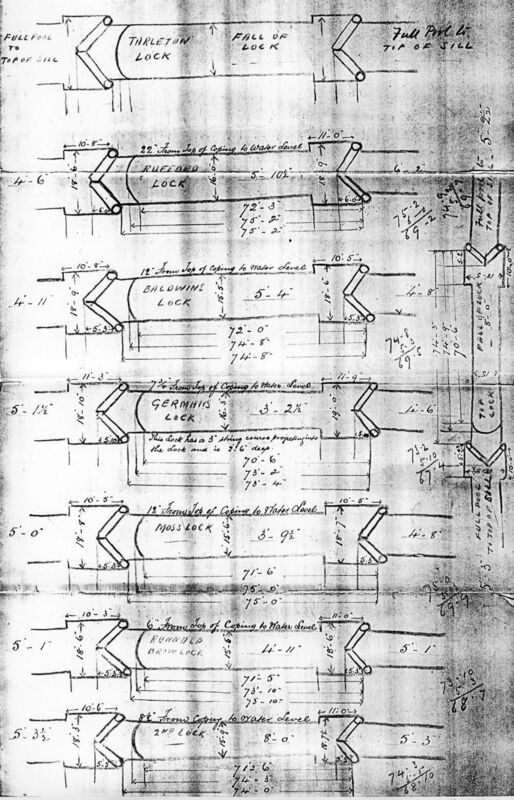 Rufford branch lock dimensions in 1890. There could be a small variation today, depending upon the angle of the mitre, which here was a bit sharper for Rufford Lock. Taking 6 feet off the shortest chamber length to allow for the mitre, on German's Lock would suggest 64 ft 6 in as the longest boat that could fit, though I am not guaranteeing that! There is a good diagram on the Pennine Waterways site on how to get a 60' boat through a 57'6" Calder & Hebble lock. The replies in this thread suggest that the same technique works on the Rufford Branch too for correspondingly longer narrowboats, making use of the curve of the cill. A picture is worth a thousand words. I found myself wondering about the shape of the cills on different waterways, looking at them while going up to Chester last summer. Unlike the curved cills described here, the Grand Union's wide locks have mainly straight cills, and I wondered if this illustrates a difference in a canal designed for wide boats as opposed to a canal whose locks were designed for pairs of narrow boats? This may perhaps also explain why bridges on some wide canals (such as going up to Chester) are much wider than the locks, to allow easy passage of a wide boat, whereas again on the GU the boats would be singled out through most of the bridges so 14ft is plenty of width. Since you will be descending first, remember that this needs much more care than ascending. In the latter case, once you are in the lock you know you will make it - but watch the water from above doesn't drown you - but the former requires you to keep a very close eye as the cill emerges (actually quite a bit before then, once you can see it you are pretty much OK). Don't forget to lift the fenders! You will get wet going down though - make sure you don't let too much water in the back of your boat! You can get a 72 foot boat into the top lock and close the gates. I managed to stop one trying to descend in the early 1970s, just as the rudder was beginning to sit on the sill. Thanks everyone for your very helpful replies to my OP. I'm so relieved as I'd have been gutted if it wouldn't have been possible. Caution is the order of the day I think, especially when descending. I will only have one crew to take action should things begin to go wrong so I'll make sure she lets the water in/out very slowly and I will keep a very watchful eye on proceedings of course. Regarding leaking lock gates, next week I am having new (and better fitting) deck boards for our cruiser stern and we have a decent cratch cover over the well deck so both of these should help to keep cascading water at bay. The only previous diagonal locking I've done is a few years ago when we went both directions through the lock at Thorne on the Stainforth & Keadby so these locks will be good a useful experience for us.. Wonderful advice from you all and I now know what to expect and how to deal with them. Consider a tarp or a rubber sheet to cover the entire deck. Easy to remove when you need to get to the engine bay, and stops water flooding your deck. --> Canal route planner says stoppages in place but a boater told me all was open again....can anyone help out please? Canalplan is confused. There may be an issue with that notice cancellation. @StephenA may be able to help. The Rufford Branch is currently open. Fantastic - Many thanks for that, I didn't want to start planning the trip if my Dad was going to be disappointed. Cheers again and happy days....so long as he stays well enough for long enough it will be a special trip. Which way are you coming? We are in Wigan at the moment,and are in the dry dock next week. Will be heading up from Aston Marina on the Trent & Mersey...not sure if it will be May / June or July as I have to watch my Dad's health. But family up in Lancaster and he met my Mum in Leigh so want to give him a special trip. The stoppages in Canalplan should not be taken as authoritative which is why it allows you to plan round them. I'm currently working on a new code block which basically goes over all the open stoppages, goes back to the C&RT website and rechecks the dates.